I never knew how lonely dealing with infertility would be. Even though I was recently married to a man I loved, worked with a group of people I considered friends, and had an active social life, I felt as as if I was dealing with infertility completely alone. I found it hard to talk about what I was going through, even with my closest friends. I was angry and confused. I struggled to find the right questions to ask my doctors, let alone try to explain what was happening to me to someone who’d never experienced it. I felt so vulnerable and not at all in control of any aspect of my life, especially my emotions. I was afraid if I ever did open up to a friend, I might unleash a maelstrom of anger and grief. So, I put on a brave face and did my best to act as if everything was okay. The more I needed the comfort and support of an understanding friend, the more I pulled into myself and away from any risk of intimacy. Eventually, of course, my grief found a small crack and pushed its way out. And once it had found a weak spot in my armor, it tore it open in the form of a humiliating public meltdown. Fortunately, a friend witnessed this and, as I no longer had anything to hide, it opened up a conversation between us. At last, I was able to talk frankly about the details of my experience and the fears, frustrations, and sadness that came along with it. Once I’d broken open, I wished I’d done it sooner. 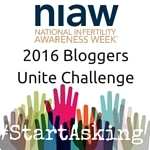 This week is National Infertility Awareness Week (#NIAW) and this year’s theme is #StartAsking. 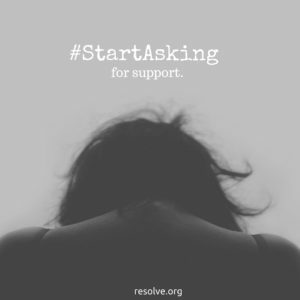 So I want to encourage you to start asking for help, to find someone to confide in, and to stop trying to battle through this alone. I know that most of us would rather walk over hot coals than ask for help. Better to have scorched and blistered feet than to permit vulnerability and open ourselves up to pity, or ignorance, or worst of all…unsolicited advice! But having just one understanding person you can trust can make an enormous difference. Before you go seeking an empathetic ear, it’s important to understand yourself and what kind of help you really want. Do you need someone who’ll sit and listen while you talk and talk and talk? Do you need someone with whom you can share intimate details of procedures and tests? Do you need to confide one single detail that you’ve never told anyone else? Do you need someone who’ll hug you while you cry your eyes out, or someone who’ll join you for a quiet walk to talk about absolutely any other topic but infertility? The Life Without Baby book has an entire chapter dedicated to finding support, and one exercise that people find helpful is to write a letter to an imaginary ideal friend, telling her exactly what you’d like from her. Tell her the kind of scenario you envision where you feel comfortable opening up, and then detail the response you’d like from her. Include as many specifics as you can. If you absolutely don’t want to hear a miracle baby story or advice like “Have you considered donor eggs/adoption/squirrel toenail tea?” write that down. If you need her to simply listen and say “I’m so sorry you’re going through this”, tell her. Once you know what you need in terms of support, then you can start to find the person to ask for it. If you’re like me, you probably have people in your life who each bring a different strength to your relationship. In my case, Friend A gives sisterly advice; B asks difficult, but thought-provoking questions and doesn’t flinch at honest responses; C will listen quietly and give a thoughtful response, and D will burst into tears, hug me, and lament how terrible things must be for me (which can sometimes be exactly what I need.) Who among your friends, family, and even acquaintances could offer the kind of support you need? Keep in mind that our dearest friends and family members are oftentimes too invested in our happiness to be able to offer the support we need. You might find that a trusted colleague, a more distant relative, or even a less intimate contact, such as hairdresser or religious counsellor, might be the perfect person to talk to. And if you truly can’t find anyone, please consider seeking professional help. As hard as it is to open yourself up to talking about this, it’s even harder to struggle along alone, so please, please, please, start asking for help. The worst thing about moving 400 miles to the northern part of my state was leaving all my friends behind. In my new city, I knew exactly three people, plus one good friend who lived an hour’s drive away. One week, while my husband was traveling, I spent much of the time alone, and frankly I felt a bit sorry for myself. 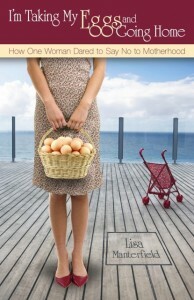 Then, on the Monday “Laura” sent me a copy of her book. I read a couple of chapters and it made me laugh. On Tuesday I spoke on the phone with “Paulina”, who was snowed under in Indiana. I’ve never met her, but we’ve become phone friends over the last couple of years. Later in the week, I chatted by email to Monica and Jody, and made plans to have coffee with Kathleen. I also finalized lunch plans with Pamela, something we’d been trying to accomplish for months, and I discovered that a long-time LWB reader lived in the next town over, so we met for drinks. I share one thing in common with all these women, and that is that we are childless, but beyond that I’ve discovered we have so much more to talk about, and that these women have become my friends. When I was dealing with infertility, I didn’t have this community. Although my friends were supportive and kind, none of them had been through anything like it. I looked for an online community, but couldn’t find one where I felt comfortable. I really did feel that I went through that whole chapter of my life almost alone. 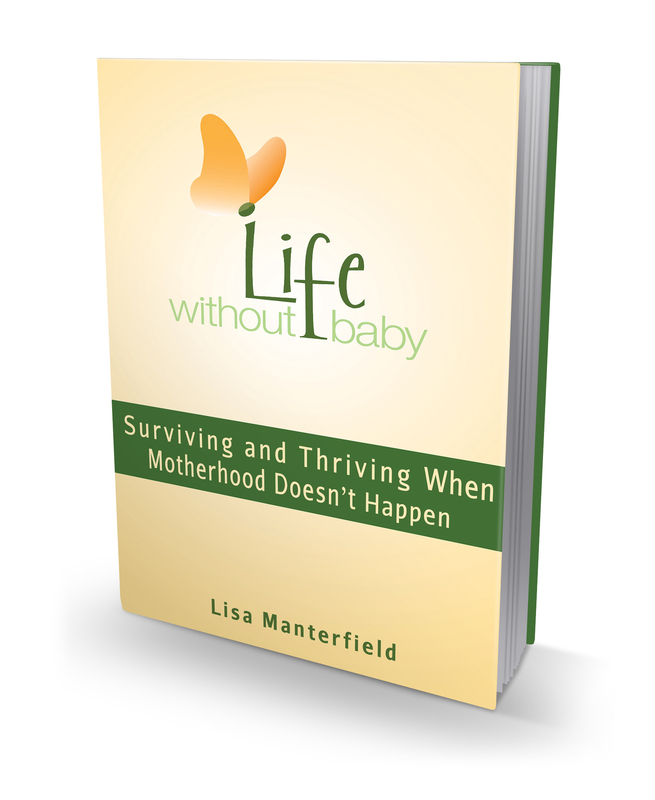 I started Life Without Baby to talk about life after infertility and to be heard, but the pleasant surprise for me is that I’ve finally found a wonderful community of women who want to talk, listen, help, and support one another. And we’re not just talking about infertility and being childless; we’re talking about books, gardening, travel, pets, family, you name it. 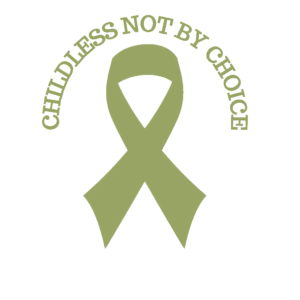 I know that many of us feel, or have felt, isolated in our childlessness, and that the web has enabled us to find our tribe. And beyond that commonality are the possibilities for friendships, and I encourage you to find those opportunities. On the private community pages, you’ll find a chat feature, and the forums are always buzzing. There are regional groups and groups for different interests. Behind this password protected wall you can safely send messages to other members or say hello on their walls. There are plenty of ways to make connections and hopefully to make some new friends. 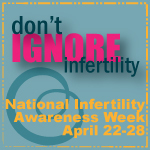 This week (April 19-25) is National Infertility Awareness Week. Of the many, many lessons I’ve learned on my own infertility journey, perhaps the most important one—the one that made it survivable—is also this year’s theme: You Are Not Alone.